Travel Sketching in Watercolor in Spain, June 15-22 & 23-30, 2020. “The best thing about our itinerary for travel sketching in Spain is the sheer breadth of subjects to choose from — that, and the near-magical light and colour of this unique part of the world. In our week together I’ll teach you techniques for capturing the close-up and colourful in villages and towns, as well as the distant and scenic on the magical coast of Costa Brava. We’ll sketch the sea, majestic cliffs, boats, a botanical garden, a castle, a medieval village, etc…In true travel sketching tradition, we’ll pack light — carrying a small bag for art materials and a folding stool (that will be provided). This workshop is designed to give you confidence sketching wherever you are, gazing at a street scene in a medieval town or the way the light grazes the trunk of an olive tree. We’ll work spontaneously, and I’ll show you how to keep your watercolour sketches fresh and colourful. Each day will start with a short demo and end with a critique, hopefully while sitting in a shady courtyard with a glass of wine in hand. As part of a small group, you’ll have plenty of individual attention as we work on value studies, composition, simplifying a scene and capturing the essence of a place. We’ll focus on having fun while we sketch, recording as much as we can as we move from café to hilltop. The aim is to have you return home with a fat book filled with fresh and colourful sketches”. Shari a Montreal-based painter, graphic design teacher, illustrator and sketch blogger, is best known for her urban scenes in watercolour. She is a correspondent for UrbanSketchers.org, a global organization that promotes on-location sketching and is co-founder of Urban Sketchers Montreal. She is the author of “The Urban Sketching Handbook: Working with Colour”. 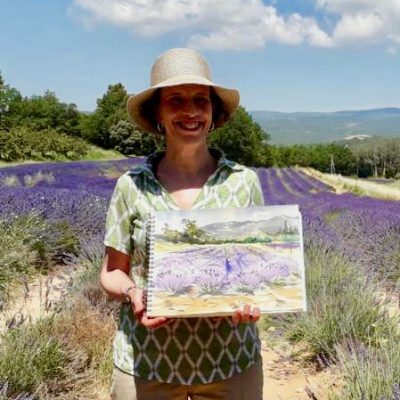 She has given many watercolour workshops both on her own and through the Urban Sketchers Workshop Program in Chicago, Galway, Barcelona, Singapore, Manchester and Porto. Shari is a signature member of the Canadian Society of Painters in Watercolour and her paintings are in corporate, government and private collections in Canada, the United States and abroad. You can find her online courses Sketching Landscapes in Pen, Ink and Watercolor and Sketching the City in Pen, Ink and Watercolor on craftsy.com. “It was a true pleasure to teach in Provence with French Escapade. I am pleased to say that the experience exceeded my expectations in every way, both for me and for my students. We shared glorious days in unforgettable sketching locations, and we were spoiled with stunning views, amazing food and a top-notch hotel. I loved being able to focus on the teaching experience and have the time to give individual attention to each student. Not having to worry about locations and logistics made that a breeze. Each day was well organized and included a superb location, ample time for painting, a bit of touring, and lots of fun. We especially enjoyed relaxing and getting to know everyone at the group dinners. Rates: US $3,190 before Nov 30 (US $3,390 after Nov 30) for a shared standard room. + US $900 for a room with sea view (the price is for the room so for a shared room, the suppl is US $450 per person).